Making a streaming service available on as many platforms as possible is key to attracting more and more customers in the cord-cutting era, and, to that end, Sling TV is now opening its doors to Google Chrome users. 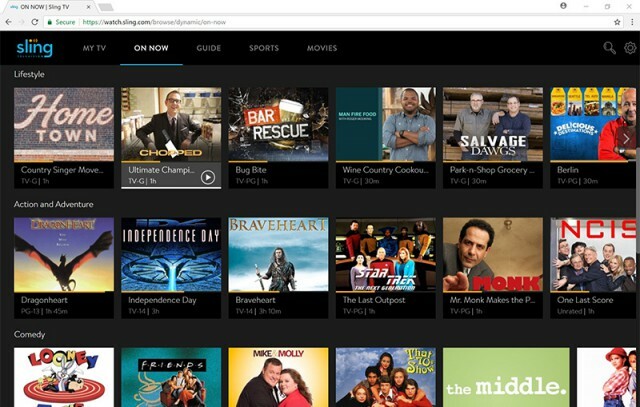 Sling TV says that its new player, which is available in beta at this stage, can be used by Chrome users on Windows devices and Macs and comes with support for both live and on-demand content. "The Sling TV experience on Google Chrome is not only fast, intuitive and incredibly simple to use, it also gives customers the added benefit of seamlessly starting live and on-demand television with a click of their mouse," says Sling TV vice president of product management Jimshade Chaudhari. "Sling customers can stream their favorite can't-miss content, like live NFL games or the next episode of 'Game of Thrones' on Sling.com without the hassles of downloading plug-ins or logging in to another device." In case you are not familiar with Sling TV or its device support, the streaming service was already available to users of PCs and Macs before support for Chrome arrived, but only through a dedicated app. By dropping this requirement, it can better compete in the cord-cutting space against players like Netflix, which have long offered browser support. Sling TV adds that its browser player is available for the latest version of Chrome, and comes with features like My TV and Continue Watching. Users also have access to their settings and parental controls through the player. The streaming service says that additional features are coming, including DVR and grid guide. Chrome, according to the latest data from NetMarketShare, has a usage share of 59.57 percent on desktop devices, making it the most-popular browser by far in this market. Microsoft's aging Internet Explorer comes second with 16.5 percent usage share, followed by Mozilla Firefox with 12.32 percent usage share.